It’s common to need your wisdom teeth extracted. Some people’s mouths are simply not designed to accommodate these teeth. As such, their presence can lead to overcrowding of the mouth, causing considerable pain and requiring extraction. Local anaesthesia — the gum is injected with a local anaesthetic, causing numbness to the area surrounding the tooth or teeth requiring extraction. Conscious sedation —a sedative is administered that leaves you fully awake and conscious to allow for cooperation with the dentist. General anaesthesia — if conscious sedation or a local anaesthetic are not the right options for you, a general anaesthetic may be organised. 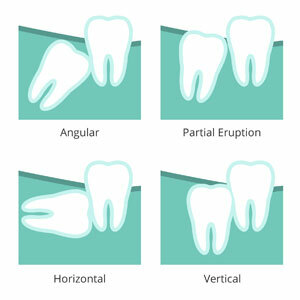 You’ll be asleep during the extraction of the tooth or teeth. We’ll provide full instructions before the procedure, but recommend patients not eat or drink for six hours before surgery. Want to know more? Email our knowledgeable team at info@parramattadental.net or give our practice a call on (02) 8677 0155.